I was then seen by a student midwife (as I was last time) who hooked me up to a blood pressure monitor and took my readings. The readings were not too bad – about 140 / 85. She also dipped my urine, which had blood and protein in it. She asked me to provide a further sample which she also tested, not sure why. She then begrudgingly took blood from the vein that I recommended and managed fine, which is great because she was desperate to try some other places which I am certain would have failed to be fruitful. I was then turfed out of the cubicle and sent to the waiting room, and was told I would be seen when my test results came back and a doctor became free. I asked how long this might be and the midwife was not prepared to commit at all. By this time it was after 1pm and you’ll recall I was waiting four hours during this stage for the same thing on Monday. Happily for me a more senior person dropped by me in the waiting room and said she thought the wait would be about an hour, and suggested I go get a sandwich. So I gratefully did. Arrived back about 1.45pm and only had to wait a little while to see a doctor. The doctor was confusing, she said I should double my dose of the blood pressure drug, then she looked at my readings and said they were not what she thought they were (presumably as they were fairly normal), but she said I should up it anyway. She said to come back for monitoring in a week. That was that, she made to leave. I asked how this might proceed throughout pregnancy and she gave me a long answer that basically said ‘who knows’ and ranged from ‘nothing further will happen’ to ‘it could be serious’. I explained that it would be helpful for me to have an idea of how frequent the monitoring would be and again she was unclear but it will certainly start with at least once a week. She said I should come next Friday and I asked if there was a quiet time to come, to which the answer was Wednesday. I said I already had a Consultant appointment on Wednesday. This seemed to really confuse issues, she didn’t seem to understand that I could be under the care of a doctor already for something else. She then started on about the nausea and how it wasn’t good to take too many drugs so I should give up the metaclopromide. She said cyclizine was adequate for nausea and it wasn’t serious as I hadn’t been vomiting. I said it hadn’t adequate, in fact. She said fine, I should give up the Cyclizine then. I decided in my head to wait and see what the doctor said next week, after all that appointment was specifically for the purpose of reviewing the nausea. 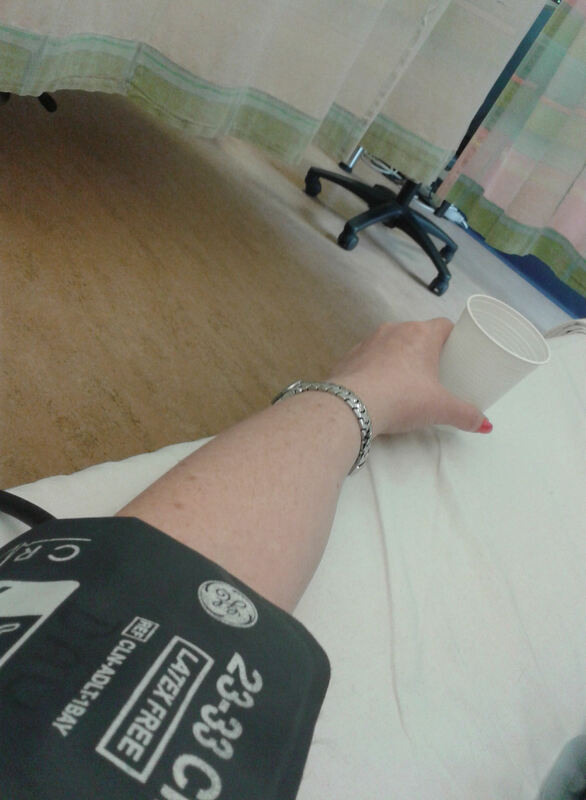 Upshot was though that I didn’t need to come for monitoring next week as well as seeing the Consultant, they would take my blood pressure, so I should just see the Consultant and take it from there. God knows how that will proceed – may well end up in triage as well – but I’m clearly not allowed to have any steer on that. Finally got out about 2.30pm, so three and a half hours this time. Plus the hour and a half of travel at each end. Almost a full day off work again. I am absolutely sick of this. I want to be well and I am happy to be treated if I’m ill. I want to be safe rather than sorry. I want to be an easy, pleasant patient and sit nicely and do as I’m told. But they just keep giving me conflicting and unsolicited information, whilst not telling me about things I actually need to know. This is taking so so much of my time and it is mind numbingly dull and desperately inconvenient and so confusing. I think the reason it is so soul destroying is they make it clear that if you’re just in for monitoring you’re right at the bottom of the food chain – their lowest priority. Last one to get seen, slow route to get your bloods done, not allowed to stay in a cubicle any longer than necessary. Now I promise I’m not suggesting they make me higher priority or stop doing their surely excellent work with emergency cases. I’m just saying maybe don’t actually treat me like I’m a burden and a low priority when they have told me to come in, and in fact told me exactly when to come in. But conversely although I am their lowest priority, this has to be the highest priority in my life and they are the ones enforcing that. They tell me when to come, where to go, where to sit, when to eat (or not). They keep me confined for hours with minimal person-contact and no idea of how long anything might be or what might happen next. Each visit is the equivalent to a full working day (three hours travel plus four hours in the hospital) which means I am denied the opportunity to work or socialise or access any support. It takes my life and my choices away, costs me money in lost earnings, and means I cannot plan ahead or commit to anything in my work or personal life. My life is yet again unpredictable and 100% taken over by my pregnancy. And yet in their eyes I’m just a burden on their system. It feels uncomfortable and unpleasant. I feel bad about myself and don’t know where I stand. And I’m just… sad and overwhelmed. I am seriously close to the edge. I want to go to bed and never get up again. Except I can’t. I’m under pressure to get a bunch of work done for the end of the financial year, and having had three days of the last six working days off sick I’ve got very little leeway.